New paper suggests extraterrestrials might mark their presence with a super-luminous laser beam. Radio has long been the mode of choice when it comes to searching for aliens, and potentially conversing with them. But radio’s not the only game in town. A recent paper in The Astrophysical Journal suggests a different tack. In it, two researchers at MIT argue that it might be easier for cosmic residents to be found if they mark their position with bright lights. The idea of signaling with light is hardly new. 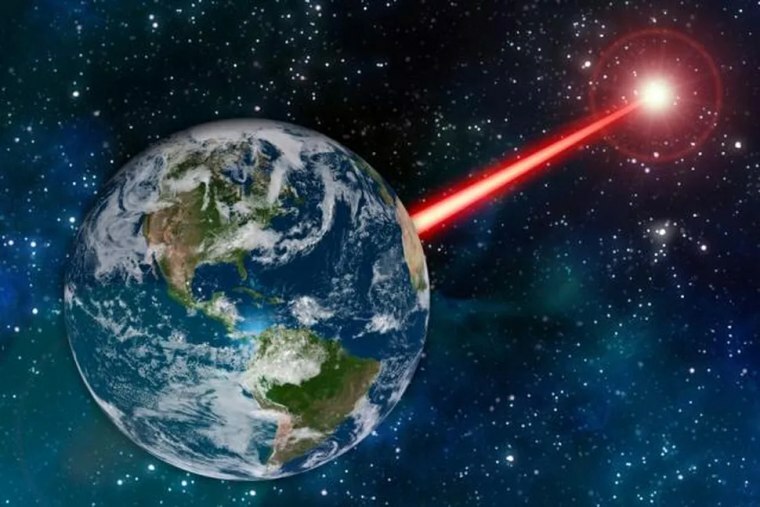 In the 1990s, scientists involved in the search for extraterrestrial intelligence (SETI) considered the following hypothetical setup: Step one — find the world’s most powerful laser. Step two — focus the laser with a telescope having a mirror at least 10 meters in diameter, producing a beam narrower than a twin bed. Step three — intermittently flash the laser, with each flash lasting a millionth of a second or so. The brain-boggling result? This titanic laser pointer would produce a pulse that would outshine the sun, even when seen from light-years away. Obviously, it would do so only during that microsecond flash. And it would be visible only to someone in the laser’s beam. But the idea that a piece of 21st century technology could momentarily outshine 500 million billion watts of sunlight is a stunning factoid, sure to impress the nerd set. If humans could do this, maybe some aliens are already doing it. This possibility has prompted a small handful of so-called “optical SETI” experiments that have searched — and continue to search — for very short pulses of light from the heavens. But in their new paper, James Clark and Kerri Cahoy suggest that it might be more interesting to build a different sort of light signal: one that doesn’t just occasionally flash but is always on. The mother of all porch lights. How would this work? Once again you begin with a powerful laser — one running at several million watts. And you’d use a laser that shines in the infrared, not in visible light. Again, a massive telescope would be used to focus the laser, producing a beam that the researchers reckon could be detected from as far away as 20,000 light-years — an always-on indication of someone’s presence. In most places in the galaxy, there are about 10 billion star systems within that distance, so this beam could reach a lot of worlds. There are big advantages to using infrared light. It passes unhindered through the dust and gas that fill interstellar space. And stars like the sun don’t naturally produce much infrared light, making a bright infrared laser on any orbiting planet stand out more. (Note that from light-years away, the light from the star and the planet would appear to come from the same place.) Any astronomer measuring the light from such a system would see an excess of infrared and quickly deduce that something “non-natural” was going on. Of course, a real porch light shines in all directions. The highly focused laser proposed by the MIT scientists would only shine in one. So, if earthlings were to build one of these things with the idea of announcing Homo sapiens’ presence, we’d really have to incessantly reposition it, pointing at one star after another, hoping to stir up some benign interest at the other end. There are no plans to construct this device now. The MIT scientists were engaging in a thought experiment to see if an always-on laser beam was feasible. Well, apparently it is, and might offer an effective scheme to find company among the stars. We’d only need to fire up our laser, shine a little light on the aliens and wait for them to get back to us. Of course, that wait could be decades, centuries or more. Mind you, not everyone is enthusiastic about constructing a bright beacon that tells others we’re home. It might just provoke hostile action by peevish extraterrestrials. But even if we decide against putting a marker light on Earth, it’s possible that other, less paranoid galactic societies have done so. And it’s a simple experiment to search for the type of modified star shine such technology would produce. Obviously, we should be looking. Maybe someone has left the light on for us. WANT MORE STORIES ABOUT THE SEARCH FOR ALIENS?